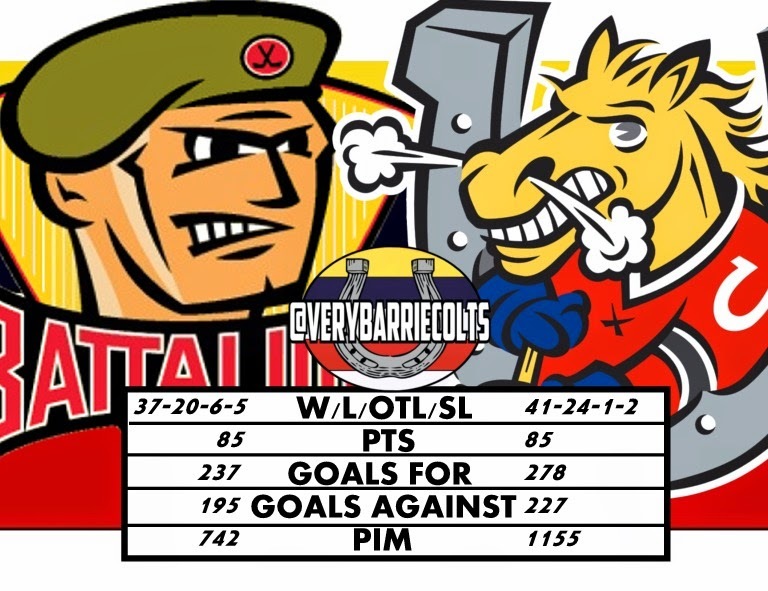 #OHL Playoff Preview: @OHLBarrieColts vs @OHLBattalion meet in Round 2. - Very Barrie Colts | A website covering the Barrie Colts of the OHL. Home Barrie Colts blog Game Preview Joseph Blandisi Mackenzie Blackwood North Bay Battalion OHL Playoffs #OHL Playoff Preview: @OHLBarrieColts vs @OHLBattalion meet in Round 2. #OHL Playoff Preview: @OHLBarrieColts vs @OHLBattalion meet in Round 2. First round of the playoffs will see the Barrie Colts(2) face the North Bay Battalion (3). 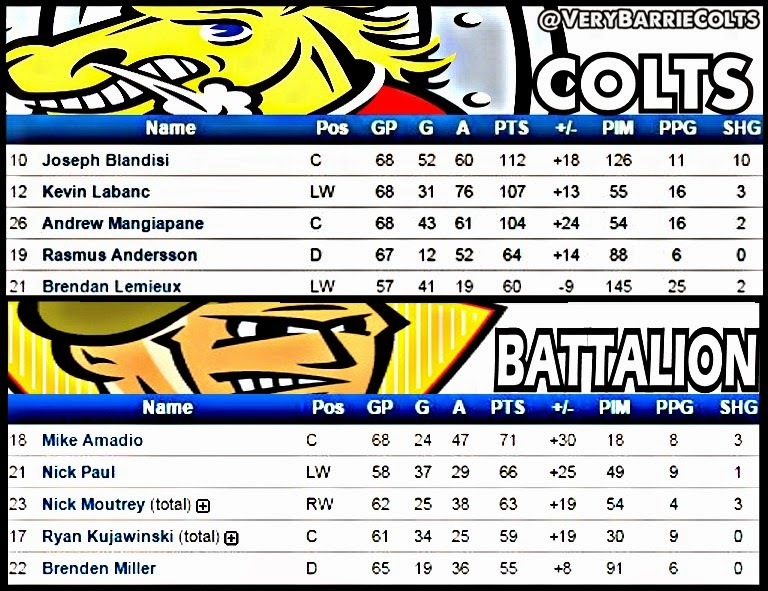 The Colts and Battalion met 6 times this season with both teams splitting the season series at 3 games a piece. In those games, Barrie outscored North Bay 18-17. Though, Barrie had a slim edge in the goals category it was North Bay that dominated in shots out-shooting Barrie 206-150. Special teams were a huge part of the 6 meetings in the regular season, neither team could use that as an advantage unless you consider that both teams were strong at killing penalties. North Bay went 7-31 on the power play (.225) compared to Barrie going 6-33 (.181) total in those 6 meetings. It can also be noted that it was the Battalion that eliminated the Colts in 6 games last year in the playoffs in the second round. The Colts had 3 players with more than 100 points on the year. Here is a comparison of Barrie's top 5 point scorers compared to North Bay's top 5. Discipline. Yes, we have said this all season and the Colts still did fine in the regular season and in the first round when the Colts swept the Bulls but this is a different series. And with all due respect to the Bulls who played hard against a stronger team, North Bay is not Belleville. Last round Barrie took a LOT of bad penalties on top of what was arguably some inconsistent officiating. Colts need to have more faith in Blackwood at times who has been solid all season. If they can use their speed instead of sticks while chasing players in their zone they should get less calls against them. They will also need to be stronger on the power play. Playing without Brendan Lemieux has effected their points on the man advantage but they have still been getting chances. Garrett Hooey has filled in well on that first unit but going 6-33 in unacceptable considering last round they managed to get 4 pp goals in a single game. Also keep your eyes open for news on Brendan Lemieux/ Nick Pastorious news. Barrie Colts head coach Dale Hawerchuk says forwards Brendan Lemieux & Nick Pastorioius out of lineup for at least another week. That tweet from Gene Pereira was 2 weeks ago as of April 7th and there has been no updates since. With any luck we can get these guys back into the lineup for this round or at some point during. By the time Game 1 happens it will have been 17 days since the 1 week timeline. SO EVERYONE CROSS YOUR FINGERS! Also be sure to show your Colts Pride and add our Twibbon to your Twitter/Facebook display picture! Find it here.